HSM runs with the NAV Versions 4, 5, 6 (NAV 2009), 7 (NAV 2013), 8 (NAV 2015) and 9 (NAV 2016) without limitations. Brief information on HSM for the different NAV Versions with sceenshots can be downloaded here. Its functionality is practically always the same. Regardless of the underlying supported NAV platform, the functionality of the HSM module is constantly evolving in terms of design (properties, calculations, reports) and is distributed via HSM updates. The actual data, i.e. substance data and standard texts (phrases), are subject to regular maintenance as well. For NAV 6 there is an RTC (Role Tailored Client) version available. In addition, HSM can be used with the NAV 6 Classic Client. 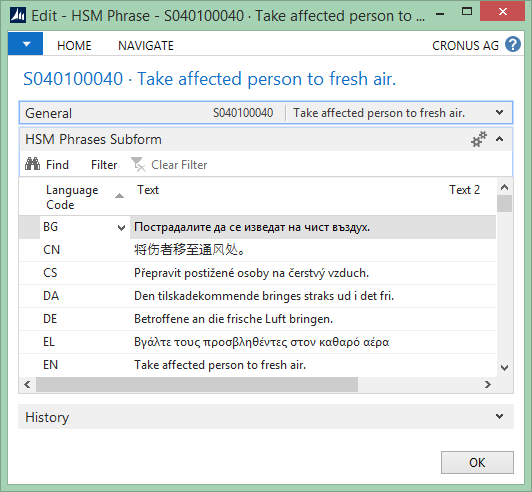 Since NAV 2013 (NAV 7) HSM versions support Unicode, as you can see on the screenshot taken from HSM for NAV 2015 (NAV 8).